In this post, I will show you how to earn 120 points per week from MCX crude oil trading using crude oil live chart. Like my other strategies, this is once again a very simple strategy and it needs no costly software. You broker’s chart is enough. I suggest Zerodha Pi OR Zerodha Kite charts. This system uses multi-time frame analysis. We will go with only the main trend. The main trend will be decided using daily candles. 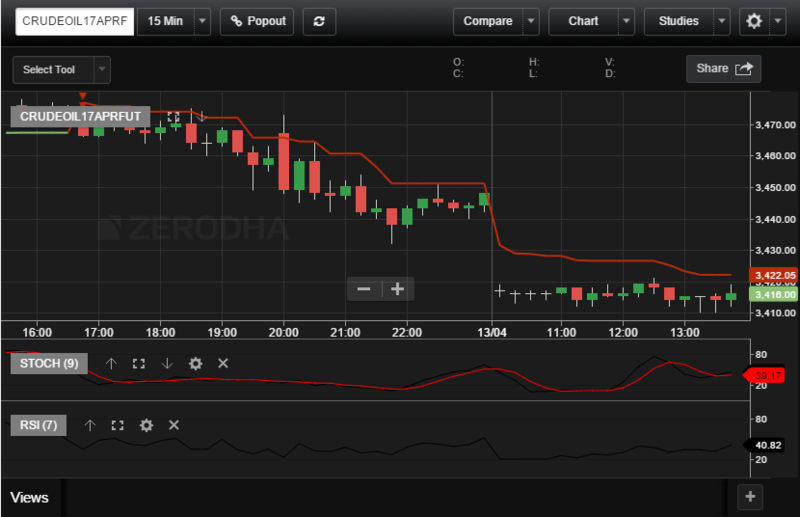 First, open the daily chart of MCX crude oil in Zerodha platform OR your broker’s platform. Now attach the SuperTrend Indicator. I suggest using 14/1.5 parameter in SuperTrend. In the image above we can see the crude oil daily, SuperTrend is in buy mode so we will only look for buy trades. I have also attached the 14-period Average True Range indicator. This will help me understanding the markets range and calculating my stop loss or targets. Now once the main trend is known to us we will switch to MCX crude oil live chart either 5 minutes OR 15 minutes time frame. Let’s also attach 9-3-3 stochastics and 7-period RSI indicator to the crude oil live chart as shown in the image below. Now as the main trend is UP we will look for stochastics and RSI to dip below 20. If we get a divergence that will be a better confirmation. Buy when stochastics crosses and comes above 20 from below 20 marks. Keep a target of 0.5 X ATR and a stop of 0.25 X ATR. In general, if you use a cover order in Zerodha, then you can trade one lot of crude oil at Rs. 4500 margins. Now your profit is 120 points X lot size 100 = Rs. 12000 per week. So by investing only Rs. 4500 you can earn Rs. 12000 weekly from this crude oil lives chart strategy. Note: Please avoid trading in late at night and close to news/inventory data. Your observations and comments are welcome below this post. Ok Prabhakar, will definitely try in future. 1. Hello Indrajeet, I am very much thankful to you. frankly speaking I learnt your ATR strategy for trading Crude Oil future. I have made a simple variation in it and it gives me dissent result since last few months only in side-ways days but it does not allow me to get in to the trade on a trending day. I am sending you the chart of crude oil dt 11 Sep 17 that I traded. To be very clear it is not my strategy but a derivative of your one. I hope you will not hesitate to rectify it at your best. Sharekhan’s ComTiger portal as I am not acquainted with Zerodha’s trading portal yet. 3. I will be thankful to you if you spare few minutes out of your precious schedule to let me know my mistakes. 4. I already have sent the chart image to your mail. 4. Thanks, Love and Best Regards. Nityananda, let me check this, will let you know. Your crude oil strategy does not work..crossover and supertrend not showing buy signal at a time..
Debasish, both criteria at same candle is not needed. Super trend is for trend deciding. Pnce trend is decided stochastics and RSI is the entry criteria. Please read the strategy again. But Dada..maximum time price I going down when RSI is crossing 20 ..plz give an example with chart. Sir, I would like to thank you for the efforts you are putting on for other’s shake. here one doubt sir. for calculating target and stop loss you say .50 and .25 respectively of ATR. sir, is it .50 of daily ATR of last day you mean or else. please do clarify sir. thanks and regards. Nityananda, yes its last day’s ATR. I want to use different in chart & Want to back test it….. 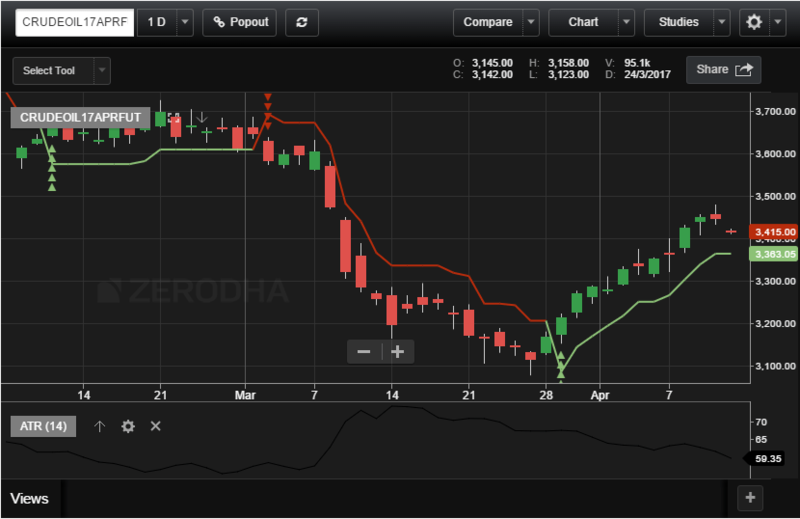 BUT in Zerodha Kite Chart Only Current Series chart data is available….. Need Crude Oil Chart Data for 5 to 7 years with 5 Min. To 1 Hour & EOD all data….. For Back Testing…. Suggestion:- Can you please suggest me Good Software for Crude Oil Back Testing or Accurate chart candle data last 5 to 7 years with 5 minute to 1 hour & EOD data also…. => Process to Use Pi for Crude Oil Last 5 To 7 year data in 5 min, 15 Min , 1 H, 4 hour, daily etc…. Differance time frame. Pls suggest me Urgent Pls. Suraj you need Amibroker software for that. You can contact us in that matter. Suraj I will try to make one video on this subject in the coming days. Sir, I am confused with RSI part, We are using stoct as the entry point, so if the rsi is not below 20, but stoct crosses abv 20 we enter the trade.How the RSI needs to be used in this system? In my view wait till both the stochastics and RSI dip below 20. The trend of SuperTrend on the daily candle is considered to be the main trend. If it is in buy mode main trend is UP, if it is in sell mode main trend is DOWN. I am a beginner to crude MCX. Could You make a video of the same and post.This will help many people out there..
Well, Siva I will try. In the meantime, you can check my YouTube channel here. HI. I want to understand what the two parameters of Supertrend indicate. You are using 14/1.5. What do they indicate. Similarly can you describe the use of ATR? Kulvinder, you can check this article to know about ATR indicator. Thank you for sending me emails with the very useful links. I am completely new to the market trying to under it. But, as my earnings are low due to which I could not able to save money for trading however, after a hard calculations I am able to save 1600pm. Once it will reach 10k then will definitely get onto the market. However, I have opened the DMAT account and doing papertrading. I need to learn options trading so that I can get some good earnings by which I can atleast pull off the commitments. Hope your support will definitely help me growing in options. Please suggest how should I proceed further in gaining knowledge on options. Shridhar, why don’t you go through the articles in Zerodha Varsity?